1: 645,576 'System of Transmission of Electrical Energy'. 2: 649,621 'Apparatus for Transmitting Electrical Energy'. 3: 1,119,732 'Apparatus for Transmitting Electrical Energy'. 2. High electromotive force make air discharge around top of transmitter (make more and more ionisation and heating in passing time of transmitting, and it create tunnel to low pressure air stratosphere). 3. High frequency current pass through ionized air to low pressure stratosphere (capacitance: 1/(2*PI*f*C) and conducting: R current). 4. Capacitance of Earth between ground and low pressure air stratosphere is all around the Earth conductor. When thundering was ending, about 20 minutes after, instrument in his laboratory was start measure the same signal from Earth. And again, and again, in that interval. All night, after thundering was gone. Interesting stuff is lifetime of that phenomenon. High voltage thunders, transform Earth conduction in long lived oscilation system. Tesla think, that it is of great important, and can be make with his transformer (need of high voltage). Earth stationary waves. It need more investigation. Why about 20 minutes interval of repeating? 1: 685,953 'Method of Intensifying and Utilizing Effects Transmitted through Natural Media' (like 685,955). 2: 685,955 'Apparatus for Utilizing Effects Transmitted from Distance to a Receiving Device Through Natural Media'. 2. Two places grounding for different wave point using. Electrical wave has movement in ground. With two point it has electro potencial and can be use one wire connection. This is important patents, and need experiments. Two plates in the ground. First rotating switch is like mechanical diode for resonant frequency. Problem with diode is diode barriers. This mechanical switching device has not barriers, and can be mechanicaly synchronise with some frequency. This is on input of device. Second rotating part is for descharge in right time. My thoughts go on, and I ask myself: Is thundering from all over the Earth, source of lot of frequency? Solar bombarding on stratosphere? Can be posible make lot of different radius switching device on the same shaft, which are for different frequency and charge more than one capacitor? And how much energy can be get? Second rotating switch can be replace with diode, but first can't (barrier), if voltage on capacitor is greater than 0.6 volt (silicon diode). This rotating swiching device is used in Tesla's patents when he detect high radiant energy. One plates in the ground and one in the air, exposed to rays. And swithing device charge capacitor. It need research. My or yours, who care? Earth is great capacitor and has some inductance too. It is like great coaxial cable. With high electromotive force it can use for transmission of energy. I put here my simplify equation for Earth Schumann frequencys. In standard equation my change is in (n+1) parameter with (n+PI/4). Constant is near c/(8R). 4R is path through Earth and back. That resonant frequency is change it day/night time with little oscilation around that. If more X-ray come from Sun to the Earth, frequency go little up. If more protons come to the Earth from Sun, it going down. This equation is middle aproximation for Schumann frequencys, and is good enough. If solar energy can change that oscilation, Tesla's transformer can change that too. Through coaxial cable can be send more high frequency, and can be generate stationar waves. In my mind I use that model for understanding Tesla's style of transmission. It is not electromagnetic wave emissions. It is current transmission through Earth capacitance and inductance (like in coaxial cable). And receiver can use differences of electromotive force on two different places of that transmission Earth line. I think that Tesla will succeed, but the world was not ready. 1: 685,957 'Apparatus for the Utilization of Radiant Energy'. 2: 685,958 'Method of Utilizing Radiant Energy'. This two patents are very important, and it can be put in part of 'Energy of space' on this web pages. But because connection with upper Tesla's system, I will explain it here. Principles for understanding in this patents are simple. When solar or other energy photons comes to plates elevating in air, it generate current in capacitor which is connecting to earth (grounded) plate. Why? We have high potential between stratosphere and Earth. Some current are always here, because of that. High energy photons or particles ionize and plate became source of energy. Capacitor must be the best, without self-discharge. It looks like little source of energy. But what will be if we virtual increase surface of plate with ionize air around plate with source of X-ray or UV-ray or other? Sun absorb UV waves when ozone is here. Is Tesla thinking about using this system near his high voltage transmitter, which generate ionization around, and with this principle collect high Sun energy, with this virtual high surface solar panel? It need more experiments, and maybe this low energy solar collector, can become high free energy source. "It is to be noted that the phenomenom here involved in the transmission of electrical energy is one of true conduction and is not to be confounded with the phenomena of electrical radiation which from the very nature and mode of propagation would render practically impossible the transmission of any appreciable amount of energy to such distances as are of practical importance." "To be more explicit, I take a very large self-inductance and a comparatively small capacity, which I have constructed in a certain way so that the electricity cannot leak out. I thus obtain a low frequency; but, as you know, the electromagnetic radiation is proportionate to the square root of the capacity divided by the self-induction. I do not permit the energy to go out; I accumulate in that circuit a tremendous energy. When the high potential is attained, if I want to give off electromagnetic waves, I do so, but I prefer to reduce these waves in quantity and pass a current into the earth, because electromagnetic wave energy is not recoverable while that [earth] current is entirely recoverable, being the energy stored in an elastic system. You see, the apparatus which I have devised was an apparatus enabling one to produce tremendous differences of potential and currents in an antenna circuit. These requirements must be fulfilled, whether you transmit by currents of conduction, or whether you transmit by electromagnetic waves. You want high potential currents, you want a great amount of vibratory energy; but you can graduate this vibratory energy. By proper design and choice of wave lengths, you can arrange it so that you get, for instance, 5 percent in these electromagnetic waves and 95 percent in the current that goes through the earth. That is what I am doing. Or you can get, as these radio men, 95 percent in the energy of electromagnetic waves and only 5 percent in the energy of the current. . . . The apparatus is suitable for one or the other method. I am not producing radiation with my system; I am suppressing electromagnetic waves. . . . In my system, you should free yourself of the idea that there is radiation, that the energy is radiated. It is not radiated; it is conserved. Because of that earth currents, put horizontal or vertical antena position, has no changing in connection betwean transmitter and receiver. If mountain is between them, it is not important, because current go through earth. It is one wire system, and capacity is for return path. It is like water pipe with oscilating piston on one end, and commpression chamber on other end. If we have 30 m of capacity disk on 60 m of high, and distance between ionosphere is more than 100 km, with 50 kHz frequency, this capacity will have about 100 Mohm. Great energy can pass through this on 50 million volt. Ionisation around disk, virtualy increase capacity, and heating and ionisation of air, increase conducting path to ionosphere too. Tesla's wireless system for transmittion of energy is simple and come from genius mind. I write this, only for historical reason. If we have energy source everywhere (from heat around us), it will be the best approach, and could not be ignore or control like this wireless system. My inductance equation is good, but problem is with self capacitance. I have in mind few equations, but sometimes work, sometimes don't. It is different for using input power, and voltage on coil. It need lot of real mesurement. I have Tesla's from Colorado, but when try with little coil (from modern experiment), it is not good. I will try to put thing together. I am not satisfied with equation which are in use. This fantastic machine need batter understanding. Spark gap (rotary or not), can be replace with thiristors in series, with optical switching. It not need resonant frequency switching, and impulse discharge (like with motor switch) will be good approach. Thyristore need be good conductor for resonant frequency oscillation, and for low switching. System with primar/secondary coil, withouth magnify coil, is bad approach, and I will go in Tesla's direction. It is way to reduce losses in conversion of power. I like this part of teoretical investigation, based on real measurement. This is 'Transmission line theory' way to go. Thanks all guy who are first thinkers in this direction. I think, it was Tesla's way too. Explanation will come, with some new ideas for secondary coil. I am add new equation for C in extra coil. It need more experiment testing, and improvement. Inductance and parasitic capacitance are near experimental measurement (I collect data...). Basic resonant frequency is very close to real measurement, when put this two equations together. It is big step! I like picture with bell ringing, which I found on web. Thanks all Tesla-guys from internet, because of their work and thoughts. This is my first collection of equations, but I use other (more precision), which I will explain in next chapters. My equation for coil inductance became worse than Wheeler's after my optimization of his arguments. 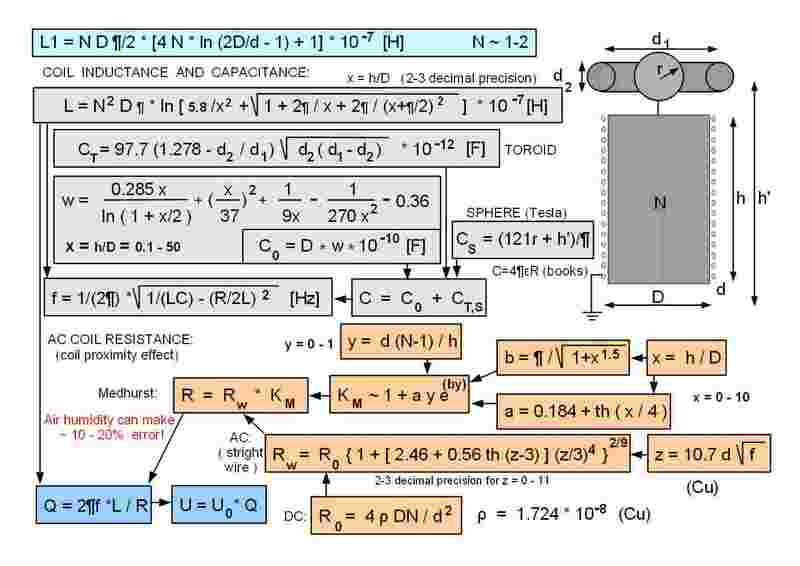 I am satisfied with 4 decimal precision, but because of capacitance equation with 2-3 decimal precision, and changing with time and place conditions, it is not so important for real device. Later, I will change toroid equation, because simplest form give batter prediction. This is the best equations for inductivity of coil. It has 3 parts in main equation and 3 input equations for k (L,S,M). For third equation, I use less precision form because of simplicity (that part in main equation has little contribution, and 2-3 decimal precision on thats low contribution is enough). This equations are more accurate in low frequency measurement, and wideness of coil D must come from middle of wire (Dmax-d). With increase of frequency, because of skin effect, that D go to (Dmax-2d). This is not important for prediction of coil resonance, because of deviation in coil capacity prediction. I just use D without that 'skin-effect' correction. Real inductivity is between that two point for D.
High frequency inductance is hardest part of that investigation. It depend of skin effect but depend from proximity factor too. It has some interesting properties. When frequency become high, diameter Do (middle of wire) going to D0-d (inner diameter of coil). But it will be for infinite frequency. With 800 kHz it is so close with D0-d. This movement of Do has 2 point: Dmin and Dmax. Real D on that frequency is between this 2 point. It is in the middle of this two point, but not exact middle. Skin effect has some little movement from that middle point. I found that I have better precision than with low frequency real measurement. If frequency is 10 kHz, function Dmax became Do (z=0 from equation, because parameter 2 which is good for high frequency become 0). If frequency is 1 kHz (very low) it is not need to calculate Dmin and Dmax, just use Do. Equation for inductance has Kf parameter. For low frequency it became 1/4 (before I did not have this part in equation). Adding this part will improve precision. But if we need information from high frequency we must this 1/4 replace with di/d (skin depth function) and recalculate D for that frequency. It is good approximation if for low frequency use Do, and for high frequency use Do-d. Most of Tesla's coils has resonant frequency around 1/4 of wavelength, where speed of electrons through wire is little less than light speed. But it is not main coil frequency. It is most useful. Calculation for very high frequency (for radio coils) is around 1/2 of wavelength. Tesla and others are use 1/4 (second harmonics) because voltage on bottom of coil is 0, and voltage on top is maximum. And wire length will be too long for 1/2 length. If you look on sine function, first maximum is on 1/4 of one sine circle (2PI or 360 degree). Some people think that equation has error, because they measure different resonant frequency on HF radio coils, but it is only different look on this problem. On HF, radio man need main resonant frequency (1/2) and is easy for get (short wire length), but in Tesla's coil we need highest voltage on top of coil but not in the middle. Only 1, 3, 5, ... harmonics (starting with 1/4) will be interesting for that purpose. Calculation for parasitic C is optimize for 1/4 wavelength. Length of wire must be less than that light speed theoretical limit (wavelength*frequency <= speed of light). I think that it is because the speed of free electron in wire is less then light speed). Length of wire in coil, is good way to see if coil work on 1/2, 1/4 or other harmonics (it will be function of voltage, because the speed of electron in wire will be function of voltage). My equation for harmonics is just approximation (for n= 1, 3, 5... where coil has voltage maximum on top). Tesla was found that capacity depend on height, and I add in toroid capacitance his founding for sphere system. It give good results, but Tesla talk that day/night, winter/summer, relative hight from sea, sun lights... can change that capacity. This is his important discovery, and we must keep in mind that changes. That high precision equations are better then my first approach. I think that I am on good way for real prediction for Tesla's high frequency coil system. Only voltage amplification don't look good, because voltage escape out much before coil amplification possibility. Maybe with energy and primary and secondary capacitance will be better approach. On high frequency reactance depend on skin-effect. Wire become virtually like electric pipe where electricity pass through outside of wire. It will change reactance. Amplification of coil depend on inductivity, frequency and that reactance. If we know that reactance, we will have equations for that maximum amplification. My surprise is when I saw that that Q is greatest than real voltage ratio. It is maybe because of low k and bad 2 coil design system. Real Q is around 10 times less. I want to find real voltage prediction. With high k between two driver coils (in Tesla's 3 coil system, where k between 3-th coil is very low), energy and capacity equations will maybe bast approach. It was hardest part of mathematical understanding. Maxwell, Rosa and others scientist are build high precision equations, but with hard (integral) computation. I just need some simple form equation, with 2-3 decimal precision. After some investigation of that part of problem, I am satisfy with equations that I found. For bad coil design (2 coil system with low k between coils) it is hardest approach. But for Tesla's 'driver' coil design, equation became so simple. His coil has 1 or 2 turn in primary part, and great diameter. Height of coil is low (for 17 turn coil in Colorado Spring it is around 1.5 m with 15 m of diameter). It is good to know that mutual inductance for extra coil is not so important. With L1, L2 and M we can calculate k coefficient and then two splitting frequency. I will get resonance with L2 (driver coil) and its parasitic capacitance, and extra coil on second frequency. But this part I need investigate for best effect. It is good to know that I have all equations. 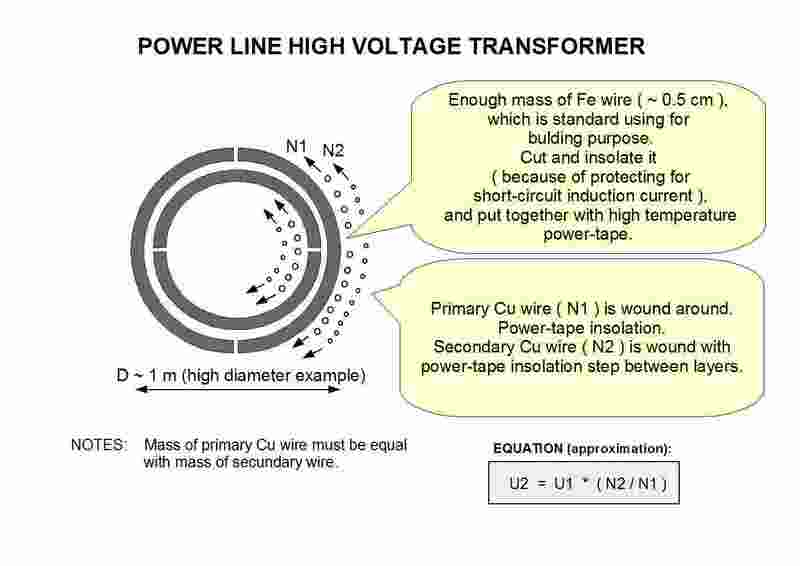 I am test inductance equation for primary 1-2 turn coil, and found that standard equation is better than my first one. Maybe my was good in some Colorado measurement, but that mutual inductance can change real one in working regime. It is hard to find real measurement with 3 coil system. I depend on Colorado Spring writings for high power Tesla's transformer. I suggest to everyone if build that kind of machine, that its design going to 3 coil direction. First 2 with high k (Tesla has around 0.6), and extra coil just like voltage amplification (with Q factor of coil). If someone find some measurement for that kind of design, please send me a link. I have lot of 2 coil design measurement, but it was not way where Tesla was going. This standard inductance equation for 1 turn coil with R*[ln(8R/r) - 2] part is close to ln (R/r) form. I use this form for Colorado Springs primary coil, because it give enough close prediction. And I replace R and r with diameter D and d because of simplicity. This equation can be in more precise form, but Tesla's primary coil is build from lot of circular wires, and transforming that wires to effective radius (or diameter) is part with errors. Skin effect is problem too. But equation and real measurement (from Tesla) are close enough. My investigation of that equation lead to some correction and it became more precise form of equation. I add frequency correction (skin depth area function). This correction became 1/4 when frequency going to low (DC) and skin depth going to center of the wire. When skin depth come to that point, z parameter must stay in 1/2 form, because function will ensure 1/4 inside main function (DC parameter). Lot of Tesla coil frequency can be cover with this equation. If frequency is high (5 MHz) number 2 in main function became around 2.2 (it need investigation). I found that N (coil turns) parameter inside natural logarithm depend with that z(f)=di/d parameter too. It is good to see that 15 m measurement from Tesla (Colorado Spring) when N=2 primary, and N=17 secondary coil, give 321 uH like this equation, when use frequency of 800 Hz. Tesla has lot of cable in primary coil (like Litz wire), and it will ensure that frequency inductance will be like in low frequency measurement. We have two choice for saving copper: with tube primary design, or with lot of insulated wire (like Tesla has). Today 'Litz-wire' can be call 'Tesla-wire' too. If copper is more than that skin depth, it is waste of material. Solar panels or waves to electricity convertors in series can be source for high voltage input for Tesla's transformer. It can be made on high sea area, and can transmitting electricity to land without wires. Other part of high solar energy source can be use (desert). Driver work like standard transformer, and need greatest k [ M = k sqrt(Lp*Ls) ]. If wires are close to N=1 primar (in circular form) I think it will be best possible k. Oil improve this nearness. Tesla's spiral coil system has first few turn close, with high radius, and other part of spiral work like extra coil (not so close to primar). It is good for low voltage (and high power, low losses) system. 1/4 waves length, must be near length of secondary wire. Maybe 4 times lower frequency (subharmonic) will be best approach (for driving extra coil). It is important to understand that 'driver' coil (high k with primary coil) work on two frequency. Second one is good for excitement of extra coil with high resonant frequency, and with design can going up. With nearness between driver coil and primary coil, can modify second frequency, end excite extra coil on its resonant frequency. It is two frequency spliting from mathematical resonant frequency from equations which I use for resonant frequency prediction. One of Tesla's discovery is important for this kind of machine, and he write about it in "New York Sun" (Jan. 30, 1901. Capacity is not constant! It varies with absolute height above sea level, relative height from Earth, and distance from Sun. It is different in day, and night, in summer and winter. Equations for toroid or sphere is not correct, and it need more investigation. Mesurement of toroid or sphere need time and place of mesurement. In closed space differences can be more than 50 %. I put toroid equation only because some times it give good prediction, but it could be wrong. I am satisfy with coil capacitance. Tesla's equation for sphere has height in it, and is first step in right direction. I think, capacity is function of solar radiation (ionosphere and ionisation of air). Withouth good mesurements from all part of the world, it is difficult part. I did not expect this, but understanding this is first step to founding some law. Earth is energy plant (ionosphere end Earth capacitor) is on high voltage. If some spaceship (or satellite) has ionization beam, it can use this natural phenomena like strong weapon. Just need energy for open ionization path to some place, and this Earth capacitor will discharge great power to that point. Possible theory (new theory I think) is that some asteroid is open that ionization path, and discharge Earth electric energy on Tunguska. It can explain change the direction of energy (ionization path and last discharge path). Using this source of energy (Earth capacitor), must have that high energy discharge problem in mind. Every great energy source is danger, and possible weapon. Every satellite, with reflector for ionization path generator, can become weapon (energy of ionosphere is all around us). Mankind must keep in mind, that only Earth peace is solution for future. On top of this page (first picture) I am explain one capacitor design build from glass plates and aluminum foils. This 'square' design can be modify with replacement of glass with some square PVC material. It will become lightweight type of capacitor. Another form of simple design could be 'pipe' type of capacitor (see picture). Standard aluminum foil is 30 cm wide and around 10-40 m long. PVC must be little more wide than 30 cm aluminum foils (I say PVC for understanding but material will be another synthetic type). Simple 4 rotating pipe could be put on some home-build winding tool (hand rotation). It could be basic capacitor, and more of them could connect in serial and parallel connection for greater capacity and greater voltage (for greater voltage 'd' of PVC foil must be greater or more capacitor must be in serial connection). Seeking resonance is great problem for Tesla's transformer, and parallel connections of more than one capacitor is important. Primary capacitance with primary inductance, must be around 1/4 wave length of secundar wire. Primary and secundary weight of wire must be equal for good work. Parasitic capacitance of secundary coil will be just in serial with adding sphere (or other) capacitance. That ideas are just from Tesla's thoughts. Standard problem with home-build power-line transformer is repair and price. I will try with this high diameter toroid design. It is only my theoretical thoughts for now, but I have good fillings... I think, that this first step of transformation is high price step. Maybe, it will not be good like standard transformer, but I think this is simplest design which I see. Maybe, it will be good for stabilize (put in base of construction) and with plastic-pipe construction, good for carry spiral type of Tesla's transformer. 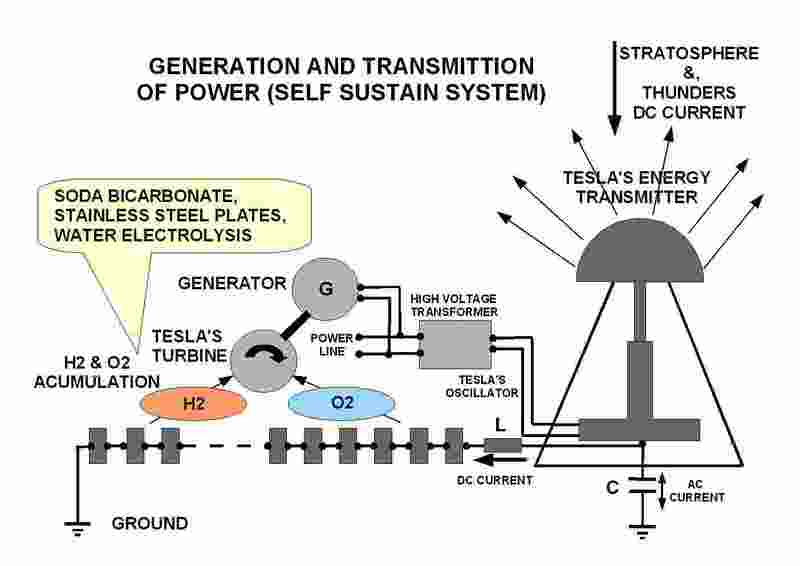 This system is Tesla's high voltage and high power transmitter. My modification in this system is using of direct current from stratosphere or thunders and extract hydrogen and oxygen from water. This simple conversion to chemical energy is better then accumulation of charge in capacitor. On other parts of this web pages (01), I am explain sodium bicarbonate electrolysis. On picture is LC filter, but maybe it will work without it. This system must be designed to receive high thunder power. I think that if thunder clouds are near this system, electric discharge of thunderstorm clouds will decrease thunders to minimum. This design is theoretical possibility and of course no one has build this kind of machine yet. It will be free energy and high power system with wireless transmission of energy. Receivers of that energy could be plate/capacitor/ground system with some switching rectifier (rotating like in Tesla's patents, or using FET's with simple controller for resonant frequency switching). Diodes are bad choice (but work if voltage in plates is greater than 0.6 V for Si). FET (transistor) has voltage in mV when transistor is ON. Standard transistor has around 0.3 V, and that is limit too.